CASA CONFORTABLE EN AJUSTE TROPICAL CERCA DEL AEROPUERTO Y CBD, CAFETERÍA LOCAL, RESTAURANTES, PANADERÍA, BOTELLA, CONVIENIANCE TIENDA Y MÁS. GRAN PISCINA Y ESPACIO EXTERIOR CON BBQ. WI-FI GRATIS !!!!! JARDINES TROPICALES LUSH EN ZONA TRANQUILA. AIRE ACONDICIONADO EN SALÓN Y TODOS LOS DORMITORIOS, VENTILADORES EN TODOS LOS DORMITORIOS Y SALÓN, .DISHWASHER, TV, ESTÉREO, DVD PLAYER Y LAVADORA. BALCÓN DELANTERO PRIVADO Y MÁS. Beautiful home with everything you need. Close to many excursions. No problems, very comfortable home. Michael was a great host. Would stay again. Kaleb and his wife where great guests and I have no problem recommending them to any hosts . Thank you for looking after my home and you are most welcome to come back and stay anytime i the future . Melanie was a great guest ,good communication ,house rules where followed and the house was left in a tidy state . I have no hesitation to recommend Melanie to any host .Thanks for looking after my place Melanie . Our second visit, as great as the first! This is the second year that my family and I have stayed here for an extended period (5-6 weeks) while I worked in Cairns. It feels like a much-loved family home, and we find it easy to be happy and relaxed there. 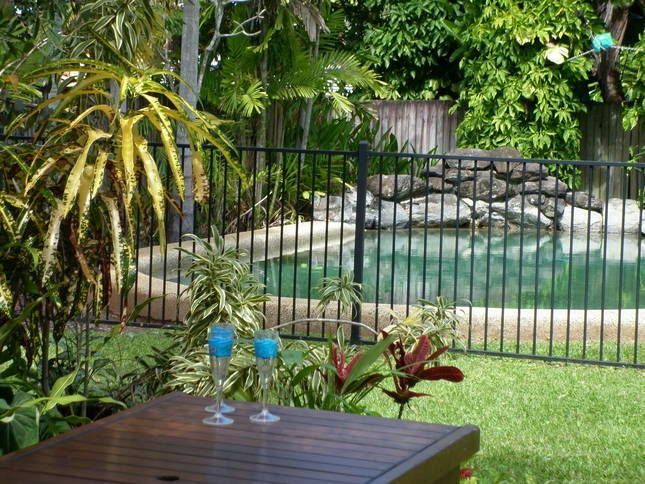 A big yard to run around, a nice pool (though we didn't use it much as it was winter) and situated in the middle of (I think) the nicest suburb of Cairns, very leafy and peaceful. Rosalyn and guests have been fantastic to have on both occassions they have stayed in the house . We always have great communication and the place is always looked after .I will always welcome Rosalyn and can highly recommend her to any host after two 5 to 6 week visits .A pleasure to deal with always !. My family and I had a great stay in this Queenslander during 5 weeks when I was working in Cairns. It has a lovely big backyard, pool, front verandah, and the feel of a genuine family home. Edge Hill is a very peaceful slice of Cairns suburbia, but still a short drive to the city centre. Exactly what we needed. Rosalyn and family where great guests .Looked after the house ,easy communication ,clean and tidy ,no fuss .Happy to recommend them to any host .5 star rating !! Had a wonderful 2 weeks. Nice and quiet, centre to most attractions. House was clean and tidy, spacious rooms. Everything in house that you could want for a holiday. Thoroughly enjoyed it! KATE AND GUESTS WHERE A JOY TO HAVE STAY IN MY HOME .I HAVE NO PROBLEM RECOMMENDING HERE TO ANY HOST .GOOD COMMUNICATION , NO FUSS ,CLEAN AND TIDY GUESTS .5 STAR RATING !